As the health of the planet continues to deteriorate, it is critical to develop environmentally literate citizens. According to Hollweg et al. (2011), an environmentally literate person is someone who “makes informed decisions concerning the environment; is willing to act on these decisions…and participates in civic life” (pp. 2-3). However, people hold many misconceptions about the environment (Coyle, 2005). Environmental education (EE) provides the methods and content that can lead to environmental literacy and a more sustainable future. Through EE, people develop questioning, analysis and interpretation skills; knowledge of environmental processes and systems; skills for understanding and addressing environmental issues; and personal and civic responsibility (NAAEE, 2010). Environmental education develops an environmentally literate citizenry that makes choices that are better for the health of the environment, leading to a more sustainable planet. Environmental education has other benefits, besides leading to environmentally literate citizens. For example, using the environment as the integrating context for learning has been linked to improved test scores, engagement, and teacher satisfaction (Liebermann & Hoody, 1998). There are also health benefits from spending time outdoors (e.g. Faber Taylor & Kuo, 2009). Advocates for environmental education have consistently targeted pre-service teacher education as an avenue to promote environmental literacy (Ballantyne, 1995; Gardner, 2009; Plevyak et al., 2001; Ruskey & Wilke, 1994; Ruskey, Wilke, & Beasley, 2001; UNESCO, 1978). Even so, teachers have continued to enter the workforce ill-equipped for the important task of preparing citizens to make educated and informed decisions about the environment (Coyle, 2005; Liu, Yeh, Liang, Fang, & Tsai, 2015; Moseley, Reinke, & Bookout, 2002; Plevyak et al., 2001; Ruskey & Wilke, 1994; UNESCO, 1978; Wilke, Peyton, & Hungerford, 1987). How are teacher education programs preparing teachers to include environmental education? Numerous barriers can make it difficult to include environmental education (EE) in pre-service teacher education programs. Some of the barriers that have been identified include deficiencies in faculty member knowledge or interest, unreceptive institutional cultures, and a lack of state requirements and national accreditation (Ashmann, 2010; Franzen, 2010; Heimlich, Braus, Olivolo, McKeown-Ice, & Barringer-Smith, 2004; Mastrilli, 2005; McKeown-Ice, 2000; Meredith et al., 2002; Powers, 2004). The North American Association for Environmental Education (NAAEE) created the Guidelines for Excellence: Professional Development of Environmental Educators (NAAEE, 2017), referred to as Preparation Guidelines for the remainder of this paper. The Preparation Guidelines address the barriers to including EE in teacher education programs by providing a reference for faculty members who are not knowledgeable about EE, a set of competencies that may ease unreceptive institutional cultures, and support for national accreditation in EE. The Preparation Guidelines delineate the competencies for preparation in EE. They are composed of twenty-four guidelines, or competencies, that are organized into six themes: environmental literacy, foundations of EE, professional responsibilities of the environmental educator, planning and implementing EE programs, fostering learning, and assessing and evaluating EE. The Preparation Guidelines define what educators should know and be able to do, ranging from content knowledge about the environment to assessing environmental education programs. Table 1 summarizes the Preparation Guidelines. The purpose of this study was to examine how elementary teacher education programs (ETEPs) in four Midwest Environmental Education Conference partner states (Iowa, Illinois, Minnesota, and Wisconsin) address and assess the competencies set forth by the Preparation Guidelines. This paper first provides a literature review of teacher education and environmental education. Then, the methods of the study and the findings are presented. The findings are then discussed and recommendations made. Table 1. Preparation guidelines. Note. From Guidelines for the Preparation and Professional Development of Environmental Educators, by NAAEE, 2010, Washington DC: NAAEE. Copyright 2000, 2004, 2010, and 2017 by the North American Association for Environmental Education. Although there are few EE-specific teacher educators in the United States (Mastrilli, 2005; McKeown-Ice, 2000; Meredith et al., 2002), some general pre-service teacher education faculty members choose to include EE in the college curriculum. However, Ashmann (2010) found that the relative autonomy of faculty members allows them to play a large role in preparing pre-service teachers. According to Ashmann, the extent to which EE is incorporated is dependent on who teaches each course. Teacher educators who are interested in or knowledgeable about EE are more likely to include EE in their courses (Ashmann, 2010; Mastrilli, 2005; McKeown-Ice, 2000). For teacher educators that choose to include EE, integrating it into methods courses is preferred (Ashmann, 2010; Heimlich et al., 2004; Powers, 2004). Pre-service teacher education faculty members who include EE in their courses choose various methods to present the topic. Sharing EE curriculum resources such as Project Learning Tree, a national curriculum guide, is a common strategy for integrating EE into existing pre-service teacher education courses (Ashmann, 2010; McKeown-Ice, 2000; Meredith et al., 2002; Powers, 2004). Another common teaching method to incorporate EE is to utilize the community. For example, faculty members often choose to take pre-service teachers on field trips to local sites (Ashmann, 2010; Mastrilli, 2005; Meredith et al., 2002; Powers, 2004). Some faculty members bring in local experts as guest speakers (Ashmann, 2010). Additionally, Powers (2004) found that some faculty members opt to teach outdoors. Practical experiences are an important component of general pre-service teacher education that builds confidence and self-efficacy in pre-service teachers (Yost, 2006). Boyd, Grossman, Lankford, Loeb, and Wyckoff (2009) found links between teacher education programs and positive student outcomes that suggest that practice in preparation programs is important for first year teachers. Additionally, Darling-Hammond (2010) notes that ‘learning to practice in practice, with expert guidance, is essential to becoming a great teacher of students with a wide range of needs’ (p. 40). In order to become great teachers, pre-service teachers must be given the opportunity to practice. Through peer teaching EE, a form of practice, students see themselves as environmental educators who are more likely to try out that role again in the future (Nelson, 2010). Practical experiences that match pre-service teachers with in-service teachers that use EE in their own teaching would be helpful, but is limited by the number of potential role models (Powers, 2004). Faculty members might address EE through a number of other strategies. For example, Powers (2004) found that faculty members modeled by teaching EE lessons and through environmentally friendly behaviors. EE was also commonly reported to be included in pre-service teacher education programs through problem solving, cooperative learning, discussions, and inquiry (Mastrilli, 2005; McKeown-Ice, 2000; Meredith et al., 2002), strategies that are supported in general education (e.g. Center for Innovative Teaching and Learning, 2012). Ashmann (2010) found that EE is addressed in courses through the introduction of EE standards, a practice recommended in the social studies context by Henning and Shin (2010). Furthermore, a number of institutions reported that they integrate EE across the curriculum (Mastrilli, 2005; McKeown-Ice, 2000; Meredith et al., 2002). Faculty members implement a variety of assessments, including some that overlap with teaching methods. Cruickshank and Metcalf (1993) propose three assessment strategies for general teacher education. One strategy is that peer teaching could be assessed by peers and the course instructor. A second strategy is that pre-service teachers could be faced with a scenario, such as a student with a learning disability, and evaluated on their response to the simulation. Finally, reflective teaching, in which pre-service teachers critically analyze their own teaching, has been proposed as an assessment strategy. Cruickshank and Metcalf specifically suggested these strategies be used to assess skills of applicants at three different entrance points: to the education program, prior to student teaching, and prior to graduating. Cruickshank and Metcalf acknowledged that it may be difficult to implement these assessment strategies but that it is important in this increased time of teacher accountability. An institutional culture that promotes environmental education leads to the inclusion of EE in college courses. “A driving force at the institutional level” (Ashmann, 2010, p. 13) is a commonality among pre-service teacher education programs that outshone others in Wisconsin. These forces ranged from an EE mission statement to a close collaboration between teacher education and natural sciences faculty. Institutional and departmental support for EE is often lacking. For example, in a study that included respondents from a broad array of colleges across the United States, Heimlich et al. (2004) found that many teacher education programs do not require environmental concepts to be included in course content. Similarly, a clearly described quantitative study of Pennsylvania’s elementary teacher education programs found that most respondents (90%) did not insist that pre-service teachers take a specific course in EE (Mastrilli, 2005). Additionally, Meredith et al. (2002) found that the majority of Ohio institutions did not require pre-service teachers to take a course in EE. It has been suggested in multiple studies that state teacher certification guidelines might have a positive influence on including EE in pre-service teacher education programs (Heimlich et al., 2004; Mastrilli, 2005; Meredith et al., 2002; McKeown-Ice, 2000). For example, Wisconsin’s Teacher Education Program Approval and Licenses (Wisconsin Administrative Code Chapter PI 34, 2000) requires programs to prepare pre-service teachers to address all state standards, including EE (Wisconsin’s Model Academic Standards for Environmental Education, 1998). Other states have EE standards: Maryland (Maryland State Department of Education, n.d.), Pennsylvania (Pennsylvania Department of Education, 2002), and Washington (Washington Superintendent of Public Instruction, 2014). However, state certification guidelines do not necessarily have a positive influence on including EE in pre-service teacher education programs in Wisconsin, a state that mandates EE for K-12 students and requires that teacher education programs prepare teachers to address these standards (Wisconsin Administrative Code Chapter PI 34, 2000). After reviewing college courses identified as integrating EE into pre-service teacher education, Ashmann (2010) reported that EE is not necessarily listed on course syllabi. Ashmann also noted that, in some cases, EE is only included if “students choose to use it as the context for completing an assignment” (2010, p. 8). For a state that prides itself on being environmentally progressive, Ashmann’s study revealed that many pre-service teacher education programs in Wisconsin are not following state mandates. Conversely, Mastrilli (2005) found that Pennsylvania state requirements positively influenced the integration of EE in pre-service teacher education programs. Although this baseline study for Pennsylvania discovered that most pre-service teacher education programs do not address all nine components of the environment and ecology standards, the majority of programs noted positive factors to including EE. The most often cited factor for including EE was “state certification guidelines and standards” (p. 26) followed by faculty interest and knowledge (Mastrilli, 2005). National accreditation in EE should positively influence EE pre-service teacher education programs (Heimlich et al., 2004). In 2007, the NAAEE partnered with the National Council for the Accreditation of Teacher Education to release accreditation standards for EE. Two universities were accredited through this program before its discontinuation in 2013. In 2014, the NAAEE piloted its own accreditation program for college and university programs. Higher education accreditation through NAAEE continues and there are currently eight accredited programs (NAAEE, n.d.). Both sets of standards were based on the Preparation Guidelines. No studies have been published about the effect national accreditation is having on EE in pre-service teacher education programs. 1. What teaching methods are used to address the Preparation Guidelines in elementary teacher education programs? 2. What assessment strategies are used to address the Preparation Guidelines in elementary teacher education programs? 3. How is extent of use of the Preparation Guidelines related to the total number of different teaching methods and assessment strategies used to address the Preparation Guidelines? The electronic survey was hosted in Survey Monkey and was divided into three sections. Section I of the survey asked for identifying information about the participants and whether or not their institution offered a minor or major degree, endorsement, or certificate in EE. Participants were also asked whether or not the institution offered one or more stand-alone courses in EE and if EE was embedded in the undergraduate program. Additionally, participants were asked the extent EE was included in the ETEP. Section II requested information about teaching methods and assessment strategies used to address the Preparation Guidelines. In Section III, participants rated their familiarity with the Preparation Guidelines and the extent of including them, as well as the importance of including EE in ETEPs. Survey validity was assessed in two ways. Content validity of the survey was assessed through a review by a panel of experts (Patten, 2001). Panelists were asked to check for content validity, clarity, and overall length and appearance of the survey. The six member panel included faculty members, a research specialist, a statistician, and teacher education researchers. As a result of the review, the survey questions were modified to allow respondents to indicate the importance of including EE in ETEPs and if their program embeds EE in undergraduate courses. The reliability and internal consistency of the survey were assessed through a pilot study. A total of 75 ETEPs from Michigan and Ohio were invited to complete the survey. The survey recruitment letter was emailed to college deans and department chairs. They were asked to forward the survey to the person most knowledgeable about EE in the elementary teacher education program. Potential participants were reminded to complete the survey up to three times. Responses from completed surveys (40%, n = 30) were analyzed by reviewing overall responses, individual responses in order to note patterns, and using Cronbach’s alpha to assess internal consistency of extent of use of the Guidelines (α = .923). Results from the validity and reliability assessments were used to improve the survey. Colleges and universities with ETEPs in Illinois, Iowa, Minnesota, and Wisconsin were identified through the state education boards. Contact information of potential participants was collected from state agencies and institutional websites. Using expert sampling, a form of purposive sampling (Trochim, 2006), the chair or dean of the ETEP at each of the 136 institutions was invited by email to participate in the survey or forward the survey to the person most knowledgeable about environmental education in the ETEP. The survey was composed of 47 items and took approximately 20 minutes to complete. Potential respondents were reminded to complete the survey once a week for up to three weeks (Dillman, Smyth, & Christian, 2009) Those who were known to have responded or forwarded the survey did not receive a reminder email. If the initial contact provided an email address for the person they forwarded the survey to, the new contact was reminded to complete the survey. The survey was closed after four weeks. Of the 136 surveys sent, 66 institutions (49%) responded to at least a portion of the survey. Fifty-two surveys were finished, resulting in a 38% completed response rate. The majority of all respondents were tenured or tenure-track faculty members. Additionally, most of the ETEPs had between one and ten tenured or tenure-track faculty members and nontenure-track faculty members. Most respondents claimed that EE was embedded in undergraduate courses at their institution. Half of the respondents indicated the institution offered one or more stand-alone courses in EE in undergraduate coursework. Of all respondents, 39% (n = 26) indicated that the institution both embedded EE in undergraduate coursework and offered one or more stand-alone courses in EE. Just 14% (n = 9) of the institutions offered a major in EE and 18% (n = 12) offered a minor in EE. Data from completed surveys were analyzed using SPSS v.20. Responses were analyzed using descriptive statistics. Regression analysis identified relationships between extent of use of the Preparation Guidelines and the number of faculty teaching methods and assessment strategies. Because the outcome variables were count variables, a Poisson regression analysis was conducted. Goodness of fit statistics were analyzed to determine whether or not the model was a good fit and if the regression analysis was appropriate. It was not a good fit due to over-dispersion of data, so negative binomial regression was used. Open-ended questions were included in the survey to allow participants to explain responses. Nine such questions were included. The number of responses to each question ranged from 1-42. Individual surveys were reviewed to provide a better picture of a single program. Then all responses to a single question were read. Open coding (Creswell, 2013) was employed to analyze the data. Codes were tallied and umbrella codes created to group similar codes. Respondents were asked about the importance and extent of including EE in ETEPs. Although 79% (n = 52) of the respondents reported they either did not include EE at all or only addressed it to a small extent, 62% (n = 33) felt that it was important to a moderate or great extent to include EE in ETEPs. Additional detail is presented in Table 2. Table 2. Extent include EE and extent of importance to include EE. Respondents explained the importance of EE and the extent of including EE in the ETEP through an open-ended question. Respondents noted that it is important to include EE in teacher education programs because of the state of the environment and the need to develop students who will become stewards of the environment. Concerns were shared regarding current pre-service teachers’ disconnection from the environment and lack of understanding of environmental issues. It was also indicated that EE meets the learning and developmental needs of a variety of learners and that, by providing EE in ETEPs, pre-service teachers will be more likely to include EE in their future classroom. The amount of content necessary to include in ETEPs was mentioned as a barrier to including EE. In reaction to this barrier, one respondent noted that “[EE] is extremely important but reality is that it must be integrated into other subject areas.” More than half explicitly stated that EE was part of methods courses. Just under a third commented that including EE in content courses was common. Respondents were asked about their familiarity with and use of the Preparation Guidelines. Responses revealed that over half (n = 29) of the respondents were not familiar with the Preparation Guidelines. Over a third (n = 20) of the respondents indicated that they were familiar with them to a small or moderate extent. Just 8% (n = 4) of survey respondents specified that they were familiar with the Preparation Guidelines to a great extent. This familiarity came from reviewing them, studying them as part of a master’s program, and using them to support grant proposals. Even though over half of the respondents noted they were not familiar with the Preparation Guidelines, over half of the respondents indicated using the themes to a small or moderate extent. Two respondents indicated that their ETEP addressed all six of the themes to a great extent. One of the two respondents credited using the Preparation Guidelines to a great extent because of the professional and educational expertise of the faculty member teaching the course. The other respondent noted that the ETEP used the state’s Department of Public Instruction science themes in the content and methods courses. 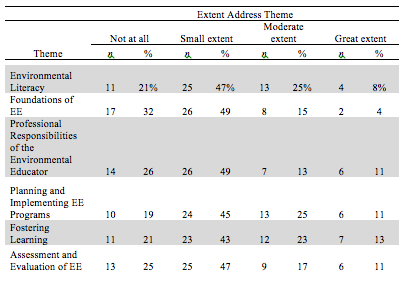 Twenty-one percent (n = 11) of the respondents commented that they addressed all six themes to a small extent and 15% (n = 8) indicated that they did not address any of the six themes in their ETEPs. The extent each of the Preparation Guidelines themes was addressed varied. Fostering Learning was the theme most commonly addressed to a great extent. Professional Responsibilities of the Environmental Educator, Planning and Implementing Environmental Education Programs, and Assessment and Evaluation of Environmental Education were also reported to be implemented to a great extent. The theme least commonly addressed was Foundations of Environmental Education. Table 3 provides a summary of the extent that respondents addressed the Preparation Guidelines themes. Table 3. Extent respondents addressed preparation guidelines. Negative binomial regression was used to analyze the relationship between extent of use of the Preparation Guidelines and the number of teaching methods and assessment strategies used. The relationship between the extent of use of the Preparation Guidelines and the number of teaching methods used was statistically significant (β = .64, SE = .12, Χ2 = 30.04, p < .001). In other words, with each unit increase in extent of use, the incidence of teaching methods increased by 1.89 methods. Forty-six respondents (81%) indicated that they used at least one teaching method to address at least one of the Preparation Guidelines themes. Twenty-eight institutions (49%) addressed all six themes through at least one teaching method. Discussion (72%, n = 41), inquiry-based learning (68%, n = 39), and assigned readings (61%, n = 35) were the most commonly used teaching methods. The relationship between the extent of use of the Preparation Guidelines and the number of assessment strategies used was also statistically significant (β = .62, SE = .11, Χ2 = 31.56, p < .001). With each unit increase in extent of use, the incidence of assessment strategies increased by 1.85 strategies. Of all respondents, 39 (71%) used at least one assessment strategy to assess the themes. 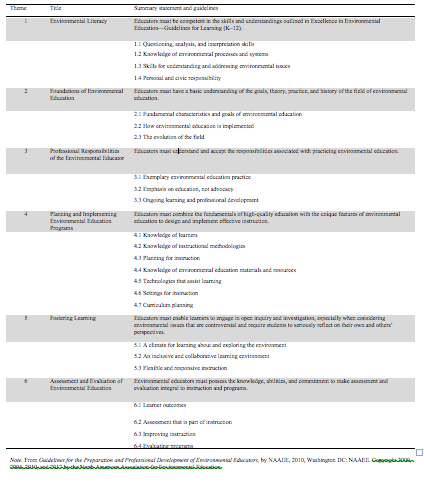 Twenty-two ETEPs (40%) addressed all six Preparation Guidelines themes through assessment strategies. Lesson plans (58%, n = 32) and reflections (55%, n = 30) were the most commonly used assessment strategies to address the Preparation Guidelines. In line with previous research (McKeown-Ice, 2000), many respondents reported they either did not include EE at all or only addressed it to a small extent. Respondents reported too many other requirements of ETEPs and not enough time to address EE, similar to the findings of previous studies (Heimlich et al., 2004; Mastrilli, 2005; McKeown-Ice, 2000; Meredith et al., 2002, Powers, 2004). Because of such barriers, EE could be integrated into what is already being taught and assessed, rather than adding another special course. This study, and others (Ashmann, 2010; Heimlich et al., 2004; and Powers, 2004), found that one route for integrating EE is through methods courses. Additionally, this study found that EE is often included in teacher education programs implicitly. This suggests that teacher educators who teach methods courses may be stakeholders in addressing EE in teacher education programs. Professional environmental education organizations and current environmental education faculty members must work with other teacher educators to develop a common language around environmental education. Professional environmental educators should help teacher educators realize they may already be presenting EE, and they can build on that to add more formal recognition for EE. This study found that the extent of use of the Preparation Guidelines was positively related to the number of teaching methods and assessment strategies used to address the Preparation Guidelines. Therefore, another recommendation is to encourage implementation of the Preparation Guidelines through professional development of teacher educators. For example, a workshop could inform teacher educators of the Preparation Guidelines and provide working time to develop a plan to implement teaching methods and assessment strategies that address the Preparation Guidelines. Such a workshop could clearly communicate goals and allow time to plan for future coursework, something that is already a necessity for faculty members. The workshop could be provided by knowledgeable teacher educators, teacher education administrators, professional environmental educators working in the community, or the North American Association for Environmental Education. Professional development that allows time and tools to map Preparation Guidelines to the curriculum could prove valuable, as it has in other contexts (e.g. Forbes, 2010). The Preparation Guidelines could be mapped to course and program curriculum in order to ensure that each standard is being addressed. Further, linking the Preparation Guidelines to discipline-specific teaching practice in higher education will inform the design of professional development as suggested by Brown et al. (2010) for a mathematics context. Additionally, modeling the incorporation of EE in teacher education curriculum and requiring that teacher educators practice EE might strengthen the professional development experience and likelihood that teacher educators would include EE in future courses. Introducing the Preparation Guidelines to teacher educators would provide a frame to include EE as well as providing a common language. Because the field of EE has defined the Preparation Guidelines as the standard for environmental educators, pre-service teachers should be better prepared to teach EE when trained according to these standards. Discussion, inquiry-based learning, and assigned readings were the most frequently used teaching methods. Discussion was the most commonly indicated teaching method used to address any of the six Preparation Guidelines themes. Mastrilli (2005), McKeown-Ice (2000), and Meredith et al. (2002) also found that discussion was a common strategy used by teacher education programs to include EE. ETEPs that use discussion as a teaching method to address the Preparation Guidelines are likely engaging pre-service teachers in forming their own ideas about EE and defining future practice in EE (Center for Innovative Teaching and Learning, 2012). However, it is possible that discussion may just be the most common teaching method used in ETEPs for all learning objectives, as the versatility of the approach allows educators to address more learning objectives than other methods. The quality and specific approach of such discussions could be explored in future research. Inquiry-based learning was used by many to address the Preparation Guidelines. A course offering inquiry methods might establish the value of the teaching method and lead to an increased use of the method, as suggested in a social studies context by Rock et al. (2006). Meredith et al. (2002) and Mastrilli (2005) found inquiry was used to present EE in teacher education programs. Like discussion, inquiry can be presented in a variety of ways. Future research could examine how the Preparation Guidelines are used within inquiry lessons. 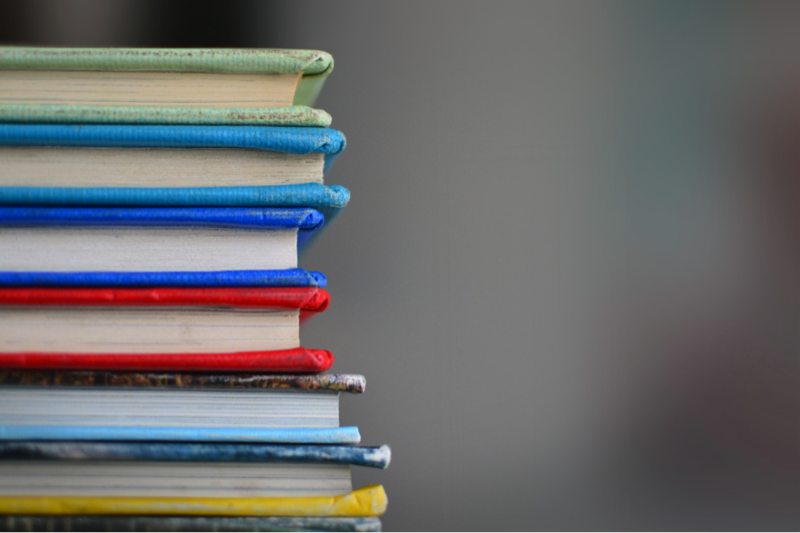 It is possible that assigned readings are simply a common strategy used in teacher education programs. As the most common response to the least addressed theme, Foundations of EE, using assigned readings warrants attention. Future research of the specific approaches used for various teaching methods, such as how assigned readings were used to teach content, would be beneficial. Additionally, research about the appropriateness of the approach for the topic would be helpful. Although previous research has found that published EE curriculum, such as Project Learning Tree, is often used by pre-service teacher education faculty members (Ashmann, 2010; McKeown-Ice, 2000; Meredith et al., 2002; Powers, 2004), only 21 respondents (37%) in this study used published EE curriculum to address any of the themes. It is possible that respondents were unaware of the availability of published EE curriculum (Heimlich et al., 2004) or, as one respondent commented, were unable to gain access to the curriculum because of training requirements in order to use the materials. Environmental education curriculum developers and coordinators should specifically reach out to teacher educators and inform them of the resource and how to gain access. Lesson plans and reflections were the most frequently used assessment strategies. Out of the respondents who used at least one assessment strategy to assess at least one of the themes of the Preparation Guidelines, lesson plans was the most commonly indicated response. Using lesson plans as an assessment strategy is a form of practice for pre-service teachers, which appears to be common in teacher education programs. Practice can positively affect pre-service teacher application of learned material (Darling-Hammond, 2010). Using reflections as an assessment strategy was the most common or second most common strategy for all of the Preparation Guidelines themes. This may be indicative of the prevalence of reflection throughout teacher education. As we work to prepare pre-service teachers to include environmental education in their future classroom, we must also prepare teacher education faculty members to explicitly include environmental education. Based on a review of the literature, Furco and Moely (2012) outline four conditions necessary for faculty buy-in of new ideas: innovation goals must be clearly communicated and in line with faculty member values, opportunity to gain expertise in the area without too much of a pull on their time, perception that there is on-going institutional support, and rewards for faculty member professional development. These conditions should be considered as each of the study areas are addressed below. Besides these conditions for faculty buy-in, some resources have already affected teacher educator inclusion of EE. One resource available to teacher educators is the Deepening Environmental Education in Pre-Service Education Resource (Inwood & Jagger, 2014). This guide provides background information about environmental education, a vision for environmental education in teacher education that includes a list of core competencies, and practical recommendations for including environmental education in teacher education programs. In Wisconsin, a resource is the Teacher Educator Network for Environmental Education, composed of all teacher educators in the state who are responsible for the environmental education requirement at their institution. This network serves as a communication hub for environmental education in teacher education programs, an advocate for teacher education program inclusion of EE, and an umbrella for EE research in higher education (TENFEE, 2015). As a result of TENFEE, one participant revised their curriculum to better address environmental education (Ashmann & Franzen, 2015). As the importance of an environmentally literate citizenry escalates, teachers and teacher educators need to be prepared to deliver quality EE. The EE profession has set a standard of preparation for educators, the Preparation Guidelines. While many teacher educators do not include EE and are not familiar with the Preparation Guidelines, they are already addressing some of them implicitly. Fostering Learning, Environmental Literacy, and Planning and Implementing Environmental Education are commonly addressed and assessed. Foundations of Environmental Education is the theme least frequently addressed by teaching methods or assessment strategies. Discussion, inquiry-based learning, and assigned readings are commonly used teaching methods, while lesson plans and reflections are common assessments. It is necessary to increase the use of the Preparation Guidelines and make their application explicit so that pre-service teachers are better prepared to provide EE to their future students. Ashmann, S. 2010. “In What Ways are Pre-Service Teachers being Prepared to Teach K-12 Students about the Environment? : An Investigation of Wisconsin’s Teacher Education Programs.” Produced under a 2008-2009 grant from the Wisconsin Environmental Education Board. Ballantyne, R.R. 1995. “Environmental Teacher Education: Constraints, Approaches and Course Design.” International Journal of Environmental Education and Information 14(2): 115-128. Boyd, D.J., Grossman, P.L., Lankford, H., Loeb, S., & Wyckoff, J. 2009. “Teacher Preparation and Student Achievement.” Educational Evaluation and Policy Analysis 31(4): 416-440. Brown, N., Bower, M., Skalicky, J., Wood, L., Donovan, D., Loch, B., Bloom, W., & Joshi, N. 2010. “A Professional Development Framework for Teaching in Higher Education.” In M. Devlin, J. Nagy, and A. Lichtenberg (Eds.) Research and Development in Higher Education: Reshaping Higher Education 33: 133-143. Melbourne, 6-9 July, 2010. Cruickshank, D.R., & Metcalf, K.K. 1993. “Improving Preservice Teacher Assessment through On-Campus Laboratory Experiences.” Theory into Practice 32(2): 86-92. Darling-Hammond, L. 2010. “Teacher Education and the American Future.” Journal of Teacher Education 61(1-2): 35-47. Dillman, D.A., Smyth, J.D., & Christian, L.M. 2009. Internet, Mail, and Mixed-Mode Surveys: The Tailored Design Method (3rd ed.). Hoboken, NJ: Wiley. Faber Taylor, A. & Kuo, F.E. 2009. “Children with Attention Deficits Concentrate Better After Walk in the Park.” Journal of Attention Disorders 12(5): 402-409. Forbes, L.S. 2010. 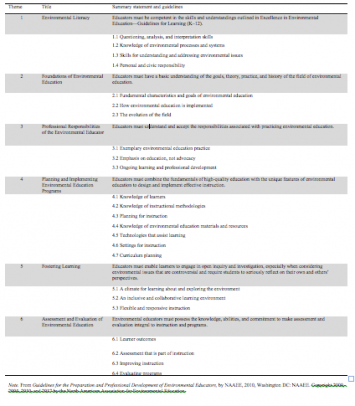 “Greening the Teacher Preparation Curriculum.” Metropolitan Universities 20(4): 87-104. Franzen, R.L. 2010. Faculty Perspectives on Environmental Education Teacher Training. Unpublished manuscript, Department of Teaching and Learning, Northern Illinois University, DeKalb, IL. Furco, A. & Moely, B.E. 2012. “Using Learning Communities to Build Faculty Support for Pedagogical Innovation: A Multi-Campus Study.” The Journal of Higher Education 83(1): 128-153. Heimlich, J.E., Braus, J., Olivolo, B., McKeown-Ice, R., & Barringer-Smith, L. 2004. “Environmental Education and Pre-Service Teacher Preparation: A National Study.” The Journal of Environmental Education 35(2): 17-21. Henning, M.B., & Shin, E. 2010. “Voices of Cooperating Teachers and Preservice Teachers: Implications for Elementary Social Studies Education.” The Councilor 71(2): 1-22. Inwood, H. & Jagger, S. 2014. DEEPER: Deepening Environmental Education in Pre-Service Education Resource. Toronto, ON: The University of Toronto Bookstore. Liu, S.-Y., Yeh, S.-C., Liang, S.-W., Fang, W.-T. & Tsai, H.-M. 2015. “A National Investigation of Teachers’ Environmental Literacy as a Reference for Promoting Environmental Education in Taiwan.” The Journal of Environmental Education 46(2): 114-132. Maryland State Department of Education. n.d. Environmental Education Bylaw. Mastrilli, T. 2005. “Environmental Education in Pennsylvania’s Elementary Teacher Education Programs: A Statewide Report.” The Journal of Environmental Education 36(3): 22-30. McKeown-Ice, R. 2000. “Environmental Education in the United States: A Survey of Pre-Service Teacher Education Programs.” The Journal of Environmental Education 32(1): 4-11. Moseley, C., Reinke, K., & Bookout, V. 2002. “The Effect of Teaching Outdoor Environmental Education on Pre-Service Teachers’ Attitudes Toward Self-Efficacy and Outcome Expectancy.” The Journal of Environmental Education 34(1): 9-15. NAAEE. 2010. Excellence in Environmental Education: Guidelines for Learning (K-12). Washington, DC: North American Association for Environmental Education. NAAEE. 2017. Guidelines for Excellence: Professional Development of Environmental Educators. Washington, DC: North American Association for Environmental Education. Nelson, A. 2010. “Environmental Education & Ecology in a Life Science Course for Preservice K-8 Teachers Using Project Wildlife in Learning Design.” The American Biology Teacher 72(3): 156-160. Patten, M.L. 2001. Questionnaire Research: A Practical Guide. Los Angeles, CA: Pyrczak Publishing. and Ecology (Vol. 22 Pa. Code, Ch. 4, Appendix B). Plevyak, L.H., Bendixen-Noe, M., Henderson, J., Roth, R.E., & Wilke, R. 2001. “The Level of Teacher Preparation and Implementation of EE: Mandated and Non-Mandated EE Teacher Preparation States.” The Journal of Environmental Education 32(2): 28-36. Powers, A.L. 2004. “Teacher Preparation for Environmental Education: Faculty Perspectives on the Infusion of Environmental Education into Pre-Service Methods Courses.” The Journal of Environmental Education 35(3): 3-11. Rock, T.C., Heafner, T., O’Connor, K., Passe, J., Oldendorf, S.,Good, A., & Byrd, S. 2006. “One State Closer to a National Crisis: A Report on Elementary Social Studies Education in North Carolina Schools.” Theory and Research in Social Education 34(4): 455-483. Ruskey, A., & Wilke, R. 1994. Promoting Environmental Education: An Action Handbook for Strengthening EE in Your State and Community. Amherst, WI: University of Wisconsin-Stevens Point Foundation Press, Inc.
Ruskey, A., Wilke, R., & Beasley, T. 2001. “A Survey of the Status of State-Level Environmental Education in the United States–1998 Update.” The Journal of Environmental Education 32(3): 4-14. UNESCO. 1978. Final Report: Intergovernmental Conference on Environmental Education. Paris: UNESCO. Wilke, R. J., Peyton, R. B., & Hungerford, H. R. 1987. Strategies for the Training of Teachers in Environmental Education. Paris: UNESCO. Wisconsin Administrative Code Chapter PI 34. 2000. Teacher Education Program Approval and Licenses. Madison, WI: Wisconsin State Department of Public Instruction. Wisconsin’s Model Academic Standards for Environmental Education. 1998. Madison, WI: Wisconsin State Department of Public Instruction. Yost, D.S. 2006. “Reflection and Self-Efficacy: Enhancing the Retention of Qualified Teachers from a Teacher Education Perspective.” Teacher Education Quarterly 33(4): 59-76. I am connected to kids environmental education. I have to be creative for that reason. Because kids always love to get new experiences. Do you have any methods or can you recommend me any ideas which I can proceed with kids? As you have mentioned “Teaching methods used to address Preparation Guidelines themes”, that’s why I asking for suggestions.